Kenny’s Department Store, with its handsome Edwardian facade and meticulously hand-selected goods, is the jewel in the crown of the small Irish town of Ardagh. Star Bluestone sells her beautifully crafted tapestries at Kenny’s. Made with natural dyes, they embody her earthy spirit and creative vision, but she has a special reason for caring about Kenny’s that extends far beyond her sales. And for Ingrid Fitzgerald, hotshot political journalist and wife of workaholic David Kenny, the store is the “other woman” in her marriage. With her children leaving home and her career taking off, she is worried that her marriage could be in jeopardy. Charlie Fallon, one of David’s staff, is among the first to hear the rumor that the store is faced with a takeover bid. With an owner who doesn’t seem his usual self and the threat of closure looming closer—what does the future hold for these women who are bound together by its fortunes? With her expertly drawn characters and heartfelt storytelling, this satisfying novel proves that “Cathy Kelly knows exactly what women want” ( Publishers Weekly ). 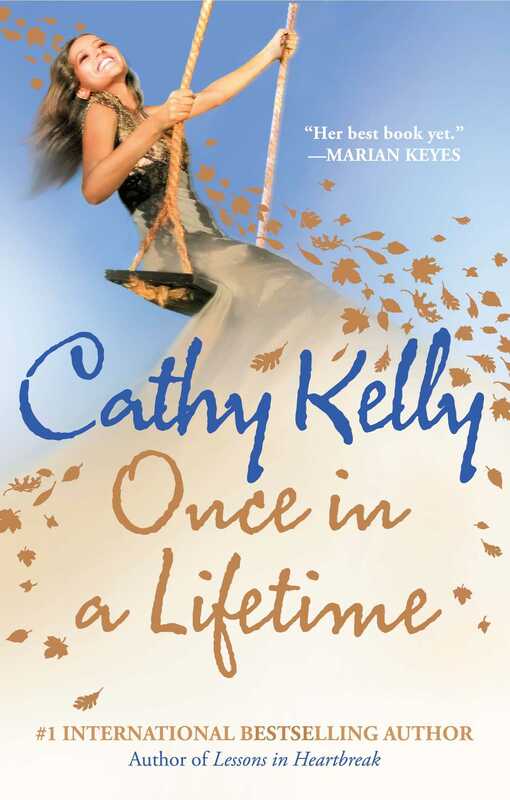 This reading group guide for Once in a Lifetime includes an introduction, discussion questions, ideas for enhancing your book club, and a Q&A with author Cathy Kelly. The suggested questions are intended to help your reading group find new and interesting angles and topics for your discussion. We hope that these ideas will enrich your conversation and increase your enjoyment of the book. Kenny’s Department Store, in the Irish town of Ardagh, has been in the Kenny family for generations. Now facing hard times, David Kenny must make difficult decisions about the store’s future, and all of the women in his life will be affected. His wife, Ingrid Fitzgerald, a high-powered television news anchor, accepts that despite decades of marriage, the store will always be David’s first love. Star Bluestone, David’s long-ago girlfriend, is an artist who sells her beautiful tapestries at Kenny’s. The women in his employ live out their daily dramas both at the store and in their personal lives. When everything suddenly changes, they must rely on one another to make it through. Once in a Lifetime is a testament to female friendships and to the kind of love that can endure hardships, betrayals, and the passage of time. 1. What does the title Once in a Lifetime refer to? 2. Were the quotes at the beginning of each chapter more meaningful to you when you found out where they came from? Did you agree with the advice? Which one stood out to you the most? 3. Ingrid and Charlie both consider motherhood to be their most important role. Marcella mourns the fact that she doesn’t have children, while Star has made peace with the fact that she doesn’t. Kitty resents the demands of motherhood and now that her children are grown is much more a child than a parent. What does Once in a Lifetime say about the nature of motherhood? Are some people more suited than others to the role? 4. Dara makes her friends and family promise not to tell Natalie about her, so that her daughter will not be bogged down by Dara’s past. Did she make the right decision? Do you think it ultimately helped or hurt Natalie? 5. Ingrid thought that she and David shared everything, but after his death, she discovers that he was keeping a number of secrets. Is it possible to ever completely know another person, or does everyone keep a part of him- or herself private? Is complete honesty essential to a successful relationship? 6. Ingrid is opposed to plastic surgery in theory, but accepts that in practice it might be necessary for her to keep her career in television. Why do you think women are judged more harshly than men for appearing to age? Is that double standard even more true for celebrities? Is it possible to age gracefully in the public eye, or must visible women such as Ingrid maintain the appearance of youth? 7. Charlie keeps an “anti-gratitude” journal, where she can write all the thoughts she can’t express out loud. “Anger in her head throbbed relentlessly, but anger on paper was flat and had no power over her.” (ms pg. 85) Why do you think the act of writing about a problem is so therapeutic? Why is it so difficult for Charlie to admit her negative feelings toward her mother and sister? 8. Ingrid “never felt that she was an imposter, that one day, she’d be recognized and fired. Lots of women did, she knew, millions of them, unsure of their own abilities and convinced that they were in high-paying jobs by mistake and that one day, the mistake would be realised.” (ms. pg. 148) Can you identify with this statement? Are large numbers of professional men also unsure of their own worth, or do you think this phenomenon is unique to women? What causes it? 9. “Star had been shocked when [her best friends] spoke disrespectfully about their religion yet remained a part of it. If you couldn’t give yourself totally, you were being a hypocrite, she felt.” (ms. pg. 179) Do you agree with this statement? Do you think a person can accept aspects of his or her religion and reject others? Is this hypocricy or acceptance? 10. After witnessing Ingrid’s grief, Marcella feels “a powerful relief that she’d never loved anybody the way Ingrid had loved David.” (ms. pg. 230) Does great love always open a person up to great pain? Is it better to love and risk that kind of devastation, or to protect one’s heart? 11. As a young woman, Dara’s “defence was a bold, slightly confrontational stare and a slash of dusty purple shadow blazed above her brown eyes. Don’t mess with me was the message from both the stare and the cosmetics.” (ms. pg. 297) In what ways do women use clothes and make-up as armor against the world? Do you think a women’s appearance can be her first defense? 12. Charlie talks about the “family box syndrome: your family put you in a certain compartment when you were small and, once you were in it, you weren’t supposed to leave—not in their minds, anyway.” (ms. pg. 98) What do you think about this statement? Is there a “box” your own family has put you into? Do people sometimes put themselves in those boxes? Have the characters in Once in a Lifetime taken on certain roles: “the career woman,” “the mother,” “the feminist” that others now expect them to conform to? 13. Dara and Lizzie are both alcoholics who drink to cover up their anxiety, their self-doubt, and their hurt. Does this image of young, attractive women contrast with your image of what an “alcoholic” looks like? Why is Natalie unable to see Lizzie’s problem when it’s so clear to Molly, who is slightly removed? 14. Many of the young women in the novel are self-critical, unhappy with themselves because they aren’t thin enough or pretty enough, or don’t look a certain way. Ingrid, looking back, says, “I never thought I was beautiful. I thought I was OK, ordinary; but when I look back at pictures of me now I see maybe I was a bit beautiful, and I didn’t appreciate it. I had no idea of my beauty or its importance, and now, when it’s gone, I recognize that I was beautiful, but I was too busy worrying about my looks to appreciate them.” (ms. pg. 449-450) Do you think any woman is really able to see herself clearly in the moment, or is it only in hindsight that we can appreciate ourselves? 15. The characters in Once in a Lifetime are multi-dimensional, showing both their strengths and their faults, their triumphs and failures. Was there any character you found purely likable or unlikable? Did you find yourself judging any of their actions, or disapproving of the choices they made? Who was your favorite? 1. Make a journal like Dara’s in which you write down the advice you would give to a child or young person. Read a few quotes out loud to the group. 2. In Once in a Lifetime, Mikey and Brendan are working their way through a Jamie Oliver cookbook as Mikey learns to cook. Go online to JamieOliver.com to see a list of his favorite recipes, and have a potluck dinner where each member of your club makes one of the dishes. 3. Read about Cathy Kelly’s experiences as a UNICEF Ambassador at http://www.unicef.ie/cathy_kelly_rwanda_1.htm. If you had the time, resources, and ability to do something similar, what would you want to do? What are some ways you can make a difference in your own community? Consider setting aside a day for your book group to volunteer together. 1. Your books are number one bestsellers in your home country of Ireland, the UK, Australia and New Zealand, as well as being published in many other countries and languages. Do international audiences respond to your novels differently? Are there some reactions you find to be universal? I think the themes in many novels are international. It doesn’t matter if you live in Cork or Chicago, love, loss and emotion are all the same. When I was young, I loved to read novels from other countries partly because I loved the way authors’ voices differed from country to country, partly because I loved learning about how other people lived and partly because there was something immensely soothing about realizing that people all over the world shared the same things. It gives me huge pleasure to get emails from readers in different parts of the globe and hear how something in particular touched them. It makes the world seem like a smaller, more human place. 2. Through your work as a UNICEF Ireland Ambassador, you’ve had the opportunity to visit places like Mozambique and Rwanda. What’s the most rewarding part about this work? Of all the places you’ve travelled, do you have a favorite? A lot of the work I do for UNICEF is to do with children who have been orphaned by HIV/AIDS. My primary area is Global Parenting which means attempting to help communities parent children who have been left without one or both parents. This sounds like an impossible task: look at how you take care of our own kids and imagine if you were gone… it’s a heartbreaking thought. So my aim is to visit places like Mozambique and Rwanda, and then tell these children’s stories when I get back so hopefully other people will be moved by their lives. It’s quite devastating to visit children who have nothing, who live in a shack with a dirt floor and who have nobody to take care of them, feed them or just hug them. The rewarding part is seeing UNICEF money in action. UNICEF fund communities to take care of their orphans in many ways, from education and health onwards. The devastating part is realizing that nothing can ever replace their dead parent. Whole generations of people are dying in Africa. One of the worst things I’ve ever seen was a woman who was HIV-positive, sitting with her eight-year-old HIV-positive little girl and waiting to see if they would be accepted onto the anti-retroviral drug scheme. Drugs are so expensive, not everyone gets them. Somebody makes that choice. I loved Mozambique for its warm-heartedness. Despite living in poverty, the people have such love in their hearts. The kids were dancing with delight meeting UNICEF people because of all the money UNICEF puts into schools. In Africa, kids adore school. They eagerness for knowledge is incredible. Rwanda was a sobering place to visit. It’s a small nation with a very low HIV rate but they have the memory of the 1994 Genocide to overcome. Again, they’re hugely friendly, warm people doing their best to overcome the past, but visiting their Genocide Museum in Kigali was heartbreaking. It’s not forgotten, though. Schoolkids learn about it to make sure it never happens again. It’s a very forward-thinking country. 3. If you were to leave a journal behind as Dara did with advice for your children, what are some of the most important things you’d want to tell them? When I was writing the book, I couldn’t think in that way or I’d have cried during the writing of the whole book, instead of just a quarter of it! Love yourself and love other people the way you want to be loved is pretty good advice but I daren’t think of having to write such a thing for my darling sons. 4. Female friendships are a huge part of Once in a Lifetime: Ingrid and Marcella, Molly and Natalie, Charlie and Shotsy. Do you have a best friend that you can tell anything? Which of the characters is she most like? I have a couple of very close female friends but none of them are like the characters in any of my books. I make all the characters up and to be honest, if I see anything in them like a real person, I try to eradicate it instantly. Perhaps on some deep subliminal level, there are facets of real people in there but as a writer, I find it impossible to work with characters who resemble real people. I need to control my characters and if they were like people I knew, I couldn’t! As to whether I tell them everything…you should see my phone bills. Few things beat being able to phone a close friend and tell her everything. I’d be lost without my women friends. 5. The Bluestone women are born with a sixth sense, and an ability to tap into the energy around them to heal and help others. Do you believe in ESP and magic, or was this just a device you used in the novel? Do you think it’s a gift only some people have, or is everyone capable of it if he or she is open to it and to the world? I do believe some people have psychic abilities, although I don’t think everyone has it and it’s just that most of the human race has simply lost it. Aeons ago, people certainly had to rely on instinct more for survival and in the modern world, we don’t. So it is possible that more people once used instinct as a tool for life. But the mind is a fabulous tool and if you read books like Malcolm Gladwell’s Blink, you see how our mind processes things on a level of which we’re rarely aware. Sadly, I do not possess psychic ability but I do my best to listen to my instincts. Interestingly, we’re told to trust our instincts as a mother when we’ve got kids, so I work on that a lot. 6. Once in a Lifetime, like all your novels, is filled with strong, vibrant female characters. Which character in the novel do you most relate to personally? Which was the most fun to write? I loved writing Once In A Lifetime and really can’t single out any one character. I did adore Star and toyed with the idea of writing another book with her in it. Still don’t know if I will or not. And I loved Ingrid’s wisdom and Dara’s fierce passion for life. Kitty was marvelous fun to write. Naughty characters are so much fun – it must be like the way actors say they love to play baddies. You can let rip. 7. “If houses could be colours, then Ruth’s home was a deep rose pink, full of warmth. Dara’s house was grey, a cold grey like endless rain.” (ms. pg. 292) If your home were a color, what would it be? Why? Probably a honeyed, amber color. I love lighting soft lights and having honey-colored shades so that the light has a glow about it. I’m very drawn to those colors. I even love perfumes in those colors, all the amber bottles dot my dressing table. I love red rooms too, although in my house right now, we only have one red room which is a bathroom with library wallpaper on the wall. It’s called ‘bibliotheque’, the French for library. 8. Although Once in a Lifetime is told primarily from the female characters’ point of view, at the end of the novel we get a glimpse of David’s thoughts and motivation. Why did you decide to include this scene? I didn’t want it to be black and white/woman: good, man: bad scenario. I believe that life is shades of grey and showing a little of David makes sense of all his choices. 9. Can you tell us a little about your research and writing process? My books start from the oddest ideas and suddenly, I am consumed with the desire to write about a character who experiences this. Creating the character then takes over and sometimes, by the time the character is formed in my head – w hich can take months – I realize that the subject matter no longer works. Cue huge panic. But I find that characters tell their own stories and if you’ve created them properly, they really do lead you on the right path. I used to interview novelists when I was a journalist and I thought they were mad when they said the characters take over, but they do. I research as I go but have to control myself or else I’d do nothing but research. You start reading about something and before you know it, hours have gone by and you’re having fun, but you’re not writing! 10. Are you working on another novel? What can we expect to see from you next? I’m finishing my twelfth novel which is due out in Ireland, the UK, Australia and Canada in Fall 2010. It’s about the intertwined lives of a group of people living in a city square in Dublin. I stopped off in the middle of it last summer (2009) to write a novella, called The Perfect Holiday, for a UK adult literacy program, and I would not recommend writing two things simultaneously!